On Sunday the 12th of September we attended the very first Wedding Fayre at the wonderful, newly refurbished, Roundhouse in Derby. 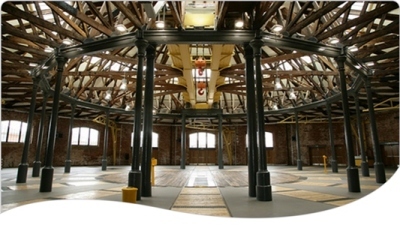 Located in what was once the old turning shed next to Derby train station, the venue is a truly grand and magnificent building with bags of character: an adaptable event space which is simply perfect for large scale weddings, corporate events, product launches, awards evenings and charity gatherings. Full details of the venue itself can be found on the new Roundhouse website or you can give Helen Peden, the conference and events manager, a quick call on 01332 520135 or email her directly. John Preston Flowers - truly magnificent flowers on a huge scale! They also happen to do more subtle pieces (that are just lovely too) but, as there are enough of those kind of florists around, I thought I'd share their large scale masterpieces with you instead! If your wedding or special event is on the larger end of the scale then John Preston is the florist for you! Bespoke Weddings - Rebecca Whitehouse and the team at Bespoke Events offer discerning couples a selection of 'high quality venues of distinction' with tailor-made wedding packages to suit all budgets. They are also very lovely people and are giving away a Wedding Venue!! Yes, you heard it right, you can win your Wedding Venue. Just go to their website for more details.